Kindergarten geometry is made easy with the Zapzapmath ecosystem.Hooray, hooray, the weekend is here! You and your training buddies are ready to enjoy your time together with a visit to the Zapzapmath theme park! Located right in the heart of this massive Zapzapmath universe, Datalien Theme Park is a kindergarten geometry game that is filled to the brim with exciting rides and game stalls. After exploring many of the theme park’s thrilling rides, from bumper cars to roller coasters, you are ready to take it easy by visiting some of the many entertaining game stalls. 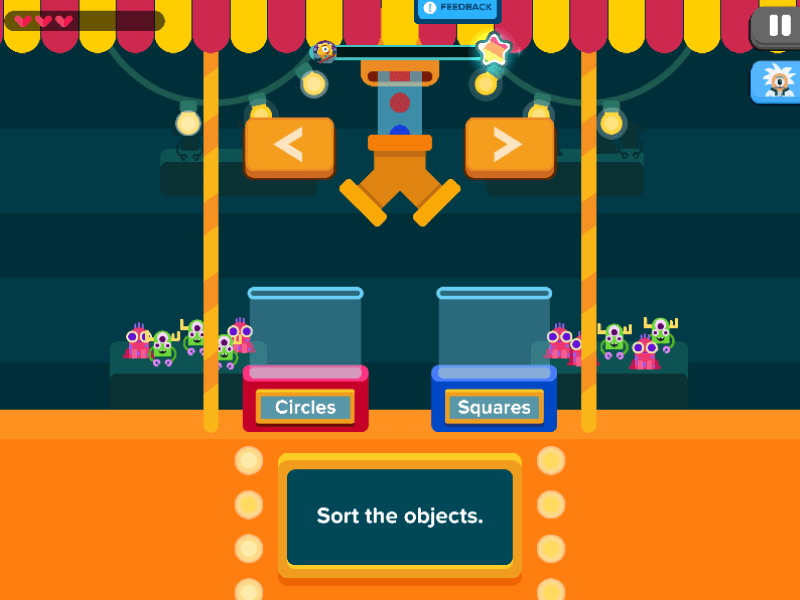 Since you have a knack for sorting shapes, you decide to try your hand at the sorting game. To score big and win some very attractive prizes, you are required to sort objects from the floating tube by shape or color. First, study the question given. Then, start sorting the objects out into piles of two by tapping on the left or right buttons. Tapping the direction buttons will drop the objects into separate containers. When all the objects have been sorted, the game progresses to new questions relating to the quantity or measurement of the grouped objects. Carefully examine each question, and answer them accordingly. You can choose and add objects up by tapping on them. The right answers will lead you to a grand prize. If you get the answers wrong, you end up empty handed. Still, you are determined to win the prize, so try and try again! In this unit of inquiry, you will be identifying and sorting a range of basic geometric shapes. Shapes are an integral part of the learning process. We interact with shapes on a daily basis, therefore shape recognition is a fundamental skill required in the early math development. Consistent training stimulates natural shape awareness and deciphers them into everyday environment. Datalien Theme Park introduces shape recognition and early data assessment of shapes, colors and patterns at a kindergarten level. The recurring practice of sorting the objects out based on their shape or color naturally increases the player’s knowledge and understanding of shapes, while the questions that follow train your mind to approach questions through addition and measurement. To build a good foundation of geometry, Datalien Theme Park encourages the routine of answering problems based on the data collected by categorizing objects established around two specific shapes and colors. This kindergarten geometry game stimulates an observant nature and detailed concentration by offering varied questions ranging from addition to shape and color selection. Overall, consistent training with this Kindergarten geometry game contributes to a boost in math confidence as well as a stronger foundation in shape evaluation. Math is shaping up to be heaps of fun!